Polin are the most prestigious oven Manufacturer in Europe and draw on 85+ years’ experience to offer a choice of Rack ovens to the market. A range of configurations is encapsulated into the two most popular models, the 4676 single rack and the 80/100 which takes either one double or two single racks. Ovens are available in gas, electric or the more increasingly popular wood pellet versions. The range is ideal for both small scale and large scale production set-ups, with the option for ovens to be installed singly, symmetrically and in groups and with the added advantage of specialist accessories to suit facilities opting for several ovens. If you are looking for a compact single rack oven, the Polin single 18” x 30” rack model which features a side burner for space saving and easy maintenance is perfect. With a small footprint, it allows greater flexibility and improved production planning. In addition, this model can be installed in modular sections through a standard doorway enabling more customers the option to choose a rack oven. We have been working very closely with Polin to manufacture and provide this model at a competitive price for the UK market. All Polin ovens are designed to ensure a greater heat exchange in the baking chamber, ultimately reducing baking times and guaranteeing optimal results, by ensuring the large amount of heat produced is readily available at the optimum temperature, and the compact single rack oven is no exception. 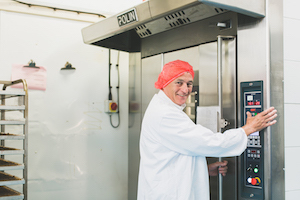 The quality of heat transfer is teamed with controls and functions to simplify production, including automatic start up, recipe storage, a rapid cooling system and a clever feature which allows the time required for the oven to achieve a desired temperature from stand-by, thus providing improved planning and flexibility. In an age where Energy efficiency and costs are at the front of all considerations, the Polin ovens serve to offer both low consumption systems and reduced heat losses, aiding the reduction of operating costs and savings. Certified by the DVGW, one of Europe’s most accredited energy institutions, the ovens high efficiency system has been designed to optimise the combustion chamber’s performance. The combustion chamber features a thick stainless steel structure, a larger number of tubes and the special construction, ensuring a larger radiant surface which is efficiently used for heat exchange and therefore providing the best use of energy and heat. A Stand-by function, allowing for reduced energy consumption when not operating and quick recovery when required; along with advantages allowing for reduced heat loss, such as a 140mm thick door with dual seal and better insulation, combine to aid overall energy and cost savings. Within the baking chamber, performance is optimised by a greater and more precise air flow offering greater air flow and uniform baking results. Extras include large readout hood mounted displays, twin speed extraction, remote control set up and more resistant stainless steel panels. These extras would suit larger installations whilst still benefitting from the standard features that take the Polin ovens to pole position in the market. Potentially one of the most crucial considerations when procuring rack ovens is the steam facilities and the Polin features a generator designed to produce a constant, abundant and consistent steam flow, to ensure optimum baking results. The system uses the tested self-cleaning spheres, that sit amongst cascading elements and allow for moist steam to be distributed evenly throughout the oven chamber. A variety of features allow for fast condensing, extraction and recovery of steam ensures every recipe is aided by the most suitable programming and baking settings. Brook Food have always been so supportive of our business, particularly in the early start-up years. Their knowledge of the machinery and importantly, the proposed manufacturing processes, helped me to scale up my business using the most efficient and cost effective machinery and equipment. Brook even helped source funding for equipment purchased. A friendly and helpful company! Our most recent Polin rack oven has been a great addition to the bakery, it is easy to set up and load, easy to clean and gives a consistent bake.